Jockey Fernando Jara gives the thumbs up in the winner's circle after winning the Classic aboard Invasor. The highlight of the World Championships is the $5 million Breeders' Cup Classic Powered By Dodge (G1), the richest race ever run in America that usually has Horse of the Year and Champion Older Horse implications. Thirteen top older horses went to the post under very dark skies, facing a 1 1/4 mile trip around Churchill Downs, the same route as the Kentucky Derby. 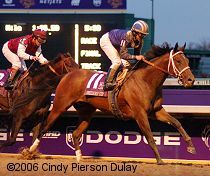 The race was touted as a clash between the best 3-year-old of the east coast, Bernardini, winner of the Jockey Club Gold Cup, Travers, and Preakness, who was sent off as the 11-10 favorite, and California's hero and 5-year-old Lava Man, the 6-1 second choice who came into the race undefeated so far in 2006 including the Goodwood, Pacific Classic, and Hollywood Gold Cup. 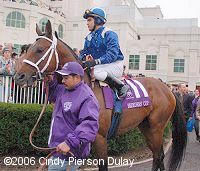 Argentine-bred Invasor was the 7-1 third choice, having won the Pimlico Special, Suburban, and Whitney handicaps but had not raced since early August. First time by with Brother Derek, Lawyer Ron, and Lava Man out front. 22-1 Brother Derek was allowed an uncontested lead early, as he set a quick pace of 23.13, 46.60, and 1:11.11 while being chased by 20-1 Lawyer Ron and Lava Man. Bernardini sat in striking position out of trouble four wide in fifth early. Entering the stretch, Brother Derek began to tire from his fast early clip, while Bernardini swept around the leaders to get to the front at the top of the stretch after a mile in 1:36.59. The favorite looked home free at the 1/8 pole but Invasor, who had sat back in eighth early on, had circled the field seven wide on the far turn and was gaining with every stride. With 1/16 of a mile to go, Invasor collared Bernardini and pulled away to prevail by a length in 2:02.18. It was a long 2 1/2 lengths back to 28-1 Premium Tap in third, and 1 length more to 21-1 late-closing Giacomo in fourth. Lava Man, who had stalked the pace the whole way, flattened out in the stretch and finished seventh. 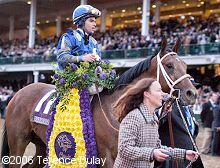 Invasor with his Breeders' Cup flowers. Winning jockey Fernando Jara said, "I just tried to not have trouble and tried to save some ground the first turn. When I made the move, tried to be in the clear. I see he was going to be tough in the end. He looked strong, and when I asked my horse to give me all. He responded good, so I knew at the quarter pole I won. It's very special because it all happened in a year, like overnight. It was all a matter of working hard." 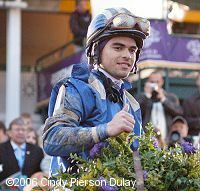 At 18, Jara is the youngest jockey to win a Breeders' Cup race. 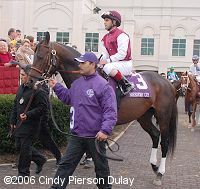 Invasor in the paddock before the race. 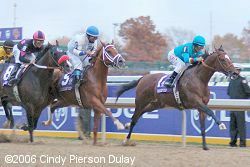 Rick Williams, vice president and general manager of winning owner Shadwell Stable said, "Beating his brother was not the goal. We happened to have two very good horses in the race, and actually when Invasor ran a fever last month and could not compete in the Gold Cup, I told Sheikh Hamdan this might be a blessing in disguise because as these two guys were to lock up in the Gold Cup, give each other a hard race, then we might be given the Breeders' Cup away to somebody else." Trainer Kiaran McLaughlin leads Invasor to the winner's circle. Winning trainer Kiaran McLaughlin said, "It's an unbelievable feeling to win for the right people. Someday I'm going to look back and try to figure how I got him beat in Dubai. I'm just so happy with everyone associated with the horse: the groom, the exercise riders, and the whole organization. I look at the (Ragozin) Sheets, and he's never reacted or bounced as sheet players referred to. He ran faster and a better number every race. He ran a negative, almost a negative 2 last time in the Whitney. Bernardini had zero, zero, zero, negative 2, back to a zero. We were right with him, and yet everybody thought we had no chance. So, it was very quiet the last few weeks about two of them meeting, was all about Lava Man, but it didn't really matter that much. It showed on the racetrack today." Second place finisher and beaten favorite Bernardini in the paddock. His trainer Tom Albertrani said, "It looked at the 3/8 pole that Javier was asking him more than he had been in his previous races. (Bernadini) was banged around a bit early but he came on with his run. I was pretty hopeful at the quarter pole. He was looking good. At the 1/8 pole I could see Invasor coming pretty hard at him. I knew right there it was going to be pretty tough to maybe hang in. Invasor had more luck than we had today, but you can't take anything away from him. This was no disgrace for us. We've had a great year." 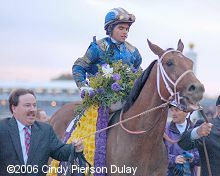 Jockey Javier Castellano said, "He ran good but we were second best today. He ran a big race. I'm not disappointed at all, you can't win all the races. I had to ask him for the first time today. He passed the other horses easily. He gave me everything. He's a fighter and didn't want to get beat. He has a good heart. I feel really lucky. He's just a 3-year-old and he'll just get better and better. Nobody wants to lose in this game, and sometimes it's hard to understand the results." Third place finisher Premium Tap in the paddock. 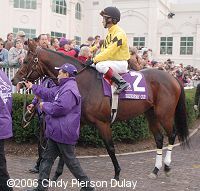 His trainer John Kimmel said, "Honestly, I figured Bernardini was the horse to beat. I never thought Invasor would win off that layoff. He (Invasor) proved that he's no fluke. My horse ran an A-race and it just shows that he belongs." Jockey Edgar Prado added, "Honestly, I figured Bernardini was the horse to beat. I never thought Invasor would win off that layoff. (Invasor) proved that he's no fluke. My horse ran an A-race and it just shows that he belongs."